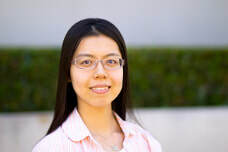 ​Xuehan Zhou is pursuing her Ph.D. in Education with a specialization in Educational Policy and Social Context (EPSC). Her research interests include education and economics, education inequality, higher education, and educational policy, especially studying the impact of education policies, programs and interventions on student performance by using quantitative research methods. In July 2017, Xuehan received her master’s degree in Economics and Education from Tsinghua University in China. Prior to joining UCI’s Ph.D. program, she was working on education policy evaluation, using quantitative methods.